Of all the seasons, fall is my favourite! I love the fashion, I love the holidays, I love the weather and of course I love the food! I try to eat as much local, seasonal produce as possible, and I love looking through Pinterest and creating boards with all the inspirational recipes I want to try! 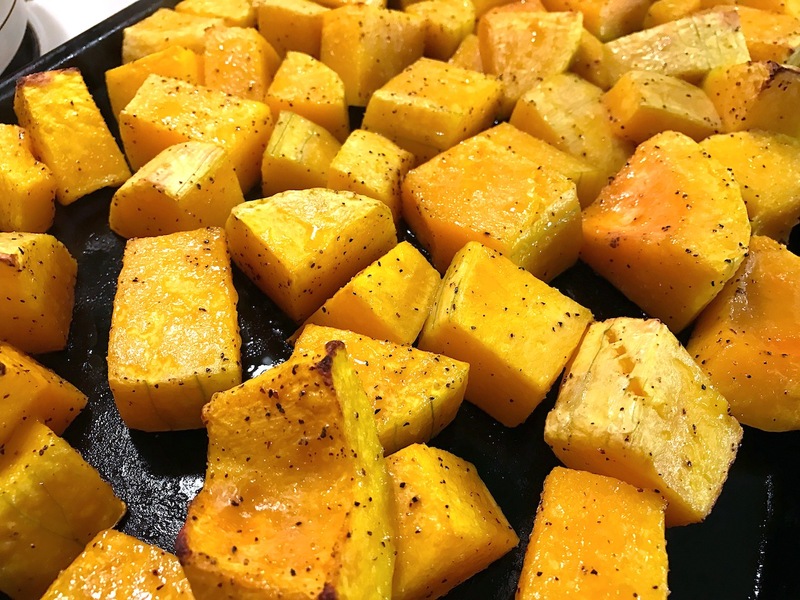 I never used to be a big fan of squash, but I’ve found so many fun and tasty ways to prepare it, that it has become a favourite in our house. Even the kids and hubby are on board the squash train now. 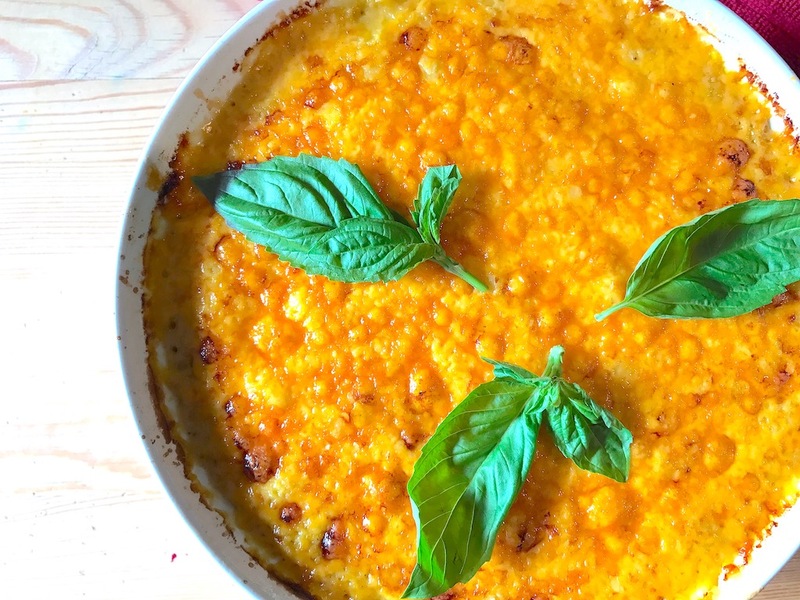 Spaghetti squash noodles are a regular meal on the menu, as well as acorn squash soup, and most recently we’ve discovered the creamiest butternut squash sauce that is perfect for a pasta dish that SCREAMS fall! The sauce is naturally gluten free, and you can make the entire dish gluten free by choosing a gluten free pasta (I love Chickapea Pasta). Before you decide that this sauce isn’t for you, I want to assure you of two things; 1) My kids and husband, who are both fairly picky eaters LOVE this sauce, and 2) If you’re not a fan of blue cheese, a good sharp cheddar tastes just as yummy. Step 1: Preheat oven to 400 degrees F. Peel the squash, scoop out the seeds and cut into cubes. Note: Many types of squash secrete a liquid when peeling, especially when underripe. This liquid on your bare skin will cause it to peel! Avoid this by choosing a very ripe squash and/or wearing gloves while peeling. Yes, I learned this the hard way. Step 2: Place squash cubes on a baking sheet and coat with olive oil, salt and pepper. Roast at 400 degrees for 30-45 minutes until it is tender. Remove and cool for 10 minutes. Step 3: When squash is cooled, transfer to a food processor, and add the egg, blue cheese, half of the mozzarella cheese, and the milk. Blend until smooth. Step 4: Heat the butter in a deep pan over medium heat. Add the onion and garlic and cook until soft. Pour the squash mixture into the pan and add half of the chicken broth, cayenne pepper, chipotle chili pepper, red pepper flakes, smoked paprika, salt and pepper. Step 5: Whisk the mixture to combine and let it simmer for a few minutes. If the sauce is too thick, add the rest of the chicken broth to thin. Let it continue to simmer to meld the flavours. Step 6: In the meantime, cook the pasta until it’s slightly underdone. I find with Gluten free pasta, you need to stir often to avoid clumping. Drain and rinse with cool water and set aside. Step 7: Lightly oil an oven-safe casserole dish and spoon a 1/4 cup of the sauce into the bottom of the dish. Mix the remaining sauce with the pasta and pour into the casserole dish. Top with remaining mozzarella and blue cheese. Step 8: Place in the oven for 15 – 20 minutes or until cheese is browned and bubbly. Top with fresh basil leaves and serve. 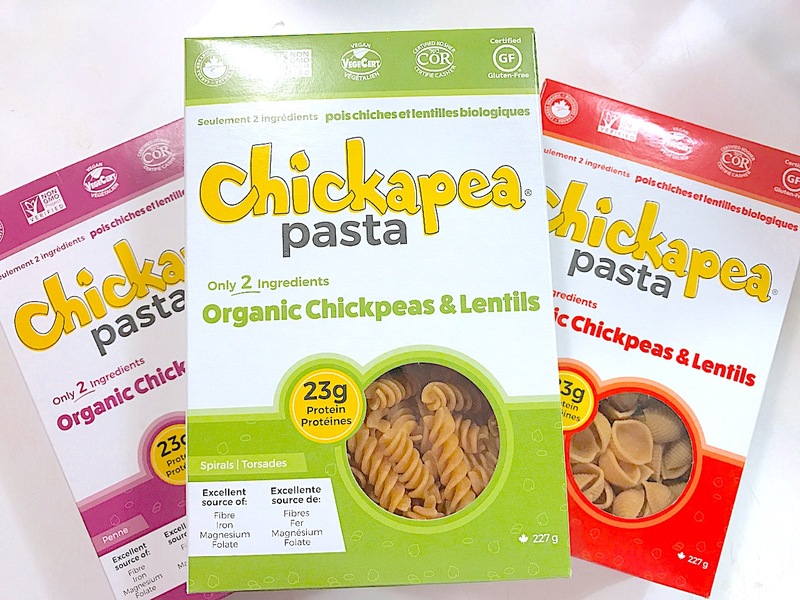 The reason that I choose Chickapea pasta is that it is made up only of organic chickpeas and organic lentils. Organic and gluten-free aside, it’s also vegan, non-GMO, has no added sugar and is made in a nut-free facility! Chickapea has 23 grams of protein and 11 grams of fibre per serving, plus a whopping 40% of daily iron intake! Best of all it’s chock full of essential nutrients: complex carbs, thiamine, folate, niacin, magnesium, B vitamins, iron, zinc and antioxidants. I know that when I send it to school with my daughter, she’ll be getting more than the empty carbs found in many white pastas. It will fill her up and keep her going in the short amount of time she has to eat! While the contest closes October 31st, you can pick up some Chickapea Pasta anytime! Find a complete list of stores that carry it here. All on the table disclaimer: While I was compensated for this post, all opinions are completely honest and totally my own. See full disclosure here. Amazon.ca is the best for me to order from. You had me at butternut squash! But seriously, I’d LOVE to try chickpea pasta, we don’t do wheat here so that would be perfect! YUM! This is the BEST combo ever!! Do give it a try, ordering from Amazon makes it super easy! Buckingham Meats is the closest for me!